A recent study has shown that green tea may have an added benefit not thoroughly investigated before—controlling blood sugar levels. While the participants in the study were mice, the results may just have found that green tea might help pave the way for new diet strategies for us humans. The active ingredient is green tea’s famous and powerful antioxidant, epigallocatechin-3-gallate (EGCG). In the study conducted at Penn State University, EGCG was found to help reduce blood sugar spikes. Half the study’s mice were fed the equivalent of about one and a half cups of green tea per day. It led to a significant reduction in blood sugar rises, compared to mice not fed the natural compound. The spikes in blood sugar in the mice fed EGCG were about 50% lower than those without. This new data comes at a time when the many benefits of green tea—including cancer protection—are making big news. The researchers found that EGCG was most effective when fed along with cornstarch. The experiment suggests that green tea could help humans control the typical blood sugar increases that are brought on when we eat starchy foods. At breakfast, for example, a cup of green tea might help a diabetic or someone at risk of diabetes prevent blood sugar spikes when they eat toast. The reason for the starch-green tea link may be linked to the way starch is converted into sugar in human and mouse digestive tracts. An enzyme called “alpha-amylase,” produced in both the mouth and the pancreas, helps break down starch. EGCG may inhibit the enzyme’s ability to break down the starch, as the researchers also found that EGCG reduced the activity of alpha-amylase in the pancreas by 34%. It could mean that people who want to limit the blood sugar spike should not add sugar to their green tea. 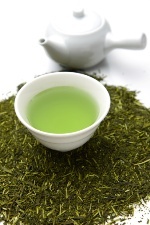 Doing so might negate the effect that the green tea will have on limiting the rise in the blood glucose level. It is also important to note that green tea and the starch need to be consumed simultaneously for any positive effect to occur. For example, drinking a cup of tea an hour after eating a bagel probably would not alter the blood sugar spike. The success of this particular study will prompt more research into how EGCG works on blood sugar spikes in humans. Since green tea is well established as a very healthy beverage choice, it’s probably a good idea to start drinking it, even if experiments on humans still haven’t been conducted yet. Forester, S., et al., “Inhibition of starch digestion by the green tea polyphenol, (−)-epigallocatechin-3-gallate,” Molecular Nutrition & Food Research, 2012; 56(11): 1,647.